Tents and the Vardo Life; What is a Bender? The bender tent provides shelter from the damp while keeping the living space outdoors. Travellers in Europe and Britain have always been associated with a style tent called a bender. This comes from the construction technique of cutting saplings and bending them into a dome, elongated dome, or half cylinder shape, These frameworks were then covered with tarps and made watertight in the temperate damp. The origins of this design are lost in the mists of time and are believed by archaeologists to be one of the earliest style of recognizable tent structure used by humans. This size bender can more than double the living space of a vardo in a matter of minutes. 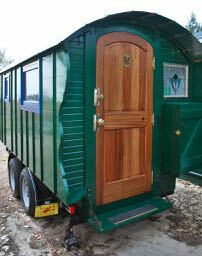 Even after a certain level of affluence allowed some Romany and other Travelling folk to own living wagons, the bender continued (and continues) to be a way to extend the living space without the need for a lot more gear. In England, Gypsy women often used their homes for fortune-telling, especially around the Gadjo (non-Gypsy) vacation centers. Image, early 20th century. Source: Romany & Traveller Family History Society. 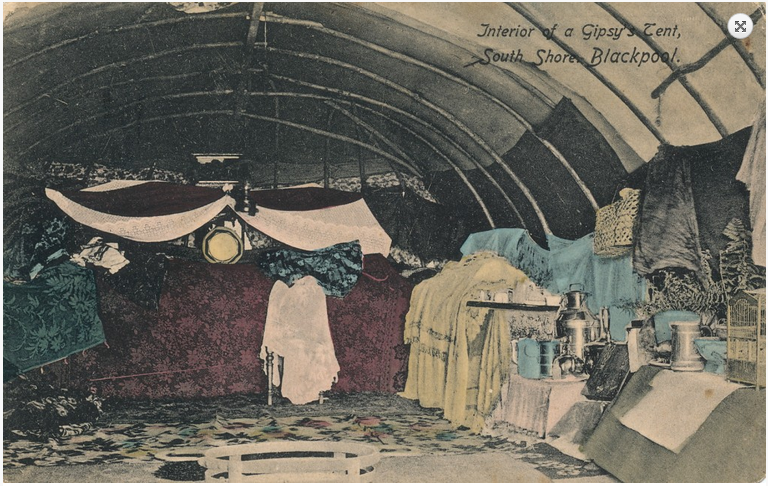 The fact that a tent becomes the subject for a Blackpool post card shows the ongoing fascination with “Gypsy Culture,” especially in the British Isles where Travellers are simultaneously suspect and romanticized. The front or vestibule provides a place to do business in relative privacy. Source: Romany & Traveller Family History Society. If you have family that me be Romany, Traveller, or Fairground folk in Britain or just want to learn more, check out the Romany & Traveller Family History Society at http://rtfhs.org.uk/. Rocky Mountain Trappers used a half-dome version of a Bender for shelter in the mountains. From Mesolithic Europe, Africa, to the New World, it’s a design that is so obvious in a woodland that it never goes away.